It’s fun to be bad! 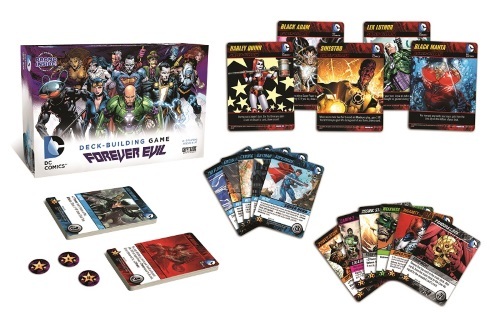 In the DC Comics Deck-building Game: Forever Evil, players finally get to play the game as some of the most famous Super-Villains in the DC Universe. Craft a truly demented deck, and give those Justice League do-gooders what’s coming to them! Card destruction is rampant in the set! Like every good Villain knows, henchmen you leave behind don’t count toward the bottom line. If you’re tired of ending the game with Starter cards still in your deck, then this is the set for you! Whittle your deck down to just the essential cards and your victory is assured. Forever Evil introduces Victory Point tokens to DC Deck-building Game! Now you can earn VPs throughout the game. Marvel at your riches while the other players can only guess at how well they are doing. Just be on the lookout for lowly thieves who would steal away your hard-earned loot. While this game is a full-fledged standalone game, it can also be mixed with all previous releases in the line. DC Comics Deck-Building Game: Forever Evil is the third standalone comics-themed game by Cryptozoic using its “Cerberus Engine” common to its deckbuilding titles. This iteration of the DC deckbuilder “base set” puts the players in charge of Supervillains instead of Superheroes, with the obvious change being that they are attempting to defeat a central stack of their Superhero nemeses instead of fighting other villains. Players may choose between Lex Luthor, Harley Quinn, Deathstroke, Black Adam, Sinestro, Black Manta, and Bizarro (and, if they are fortunate enough to get a first retail release, the promo supervillain Bane). Once again, the central mechanics remain unchanged, with the common setup cards (Punch, Vulnerability, Kick, Weakness) sporting new artwork. A common mechanical theme in Forever Evil is destruction — unlike its predecessor base sets, there are abundant cards which destroy other cards in your hand or discard pile, in the Line-Up, or even in a foe’s discard pile. Villains do like their mayhem and devastation, after all. This not only enables thin-deck strategies, it encourages them: Punch and Vulnerability cards can rapidly be eliminated from players’ decks. Many of the destruction cards will pay out in Victory Point (VP) tokens if cards with a cost are destroyed, allowing players to thin their decks down even further while maintaining the total VP they have acquired. The VP tokens themselves are new, with several cards in the set encouraging acquisition or theft of the tokens, and some even getting more powerful as players accumulate more such tokens. Certain starting Supervillains have a built-in destruction mechanic (Black Adam, Bane) or ability that works off of the destruction of their cards (Deathstroke, Bizarro). Black Manta operates as a reverse-Aquaman, placing gained cards on the bottom of his draw deck. Lex Luthor and Sinestro provide access to card draw if their acquired cards are of the correct type, and Harley Quinn proves surprisingly resilient to opponents’ discard strategies. Another theme is direct attacks. Instead of primarily blanket Attack effects that hit everyone except the current player, many Attack cards in Forever Evil ask you to choose a specific foe, dragging someone who is galloping away with the game back down. To counteract this, there are also many cheap and simple Defense cards available. Every card type (except Location) has a new 1-drop card, each worth 0 VP, that does nothing by itself, but provide a boost if destroyed in any zone — from your discard pile or hand, from the Line-Up, or even from an opponent’s discard pile. These cards round out awkward buy turns where you have a bit of leftover Power after buying your main target. It is possible to have the Line-Up clog up with expensive purchases, as with previous sets, but Forever Evil manages to have a wide array of small buys — 1-, 2-, or 3-drop cards — so that hopefully such clogs will be scarce. The Main Deck cards are a bit of a hodgepodge, with no real unifying source, though one of the groups that is represented is the Crime Syndicate of America (the Earth-3 villainous counterparts of the Justice League), with Villain characters such as Ultraman, Owlman, and Superwoman, each of which has a Line-Up destruction ability and a ramping Power generation. Rumor has it the CSA villains will play a central part in the third Crisis expansion (designed for use with this base set), due to release later in 2016. The VP powerhouse cards in the Main Deck are Phantom Stranger and Deathstorm, both of which have destruction abilities, and both of which provide up to 10 VP each depending on how well you were able to thin down your deck. The “multiple accumulator” card in this set is the Royal Flush Gang, a card-cycling Villain which provides no card advantage (draw two, discard two), but which gives you VP based on each other Royal Flush Gang played that turn. Start gathering more than two of these, and your VP token gains will be exponential. Firestorm and Firestorm Matrix both encourage the removal of powerful cards from your deck (meaning they no longer contribute to your end-of-game VP total) by providing a high level of re-use or ramp-up. Never underestimate the strength of using your Firestorm Matrix on a “mere” Kick for a guaranteed +2 Power every turn! Mechanically, Forever Evil is very coherent. The constant deck-thinning leads to more powerful decks, but does so universally — it is rare for someone to not have access to high-Power turns. The ubiquity of smaller-cost cards means that there is almost always something to buy. The addition of VP tokens as a manipulatable, tangible measure of partial victory feels thematic with the Supervillains battling each other over who takes credit. In fact, unlike the previous sets, the game feels somewhat more thematic — even if the card pool is not terribly cohesive, the constant use of Attack cards and the encouragement of messing with each other feels very villainous. This is one of the levels where this set succeeds and its predecessors do not. A few balance issues exist with the card pool; sadly, one of them involves the starting Superhero setup, and one of them involves one of the Supervillains — see the Game Tips for Flash and Bane which I have written on this subject previously. There are new components for this set, in the form of Cold Gun tokens (large tokens to indicate a card “frozen” in the Line-Up), which are fine, and the VP tokens, which leave something to be desired. Provided in values of 1, 5, and 10, the tokens are of uniform size and color, meaning they either need to be pre-sorted, or careful attention needs to be paid so a player doesn’t inadvertently grab the wrong value when taking points from the pool. This would have been an easy thing to avoid in design, so it’s unfortunate that Cryptozoic failed to do so. Finally, this set integrates very well with expansion sets such as the Crisis sets — the Forever Evil main deck works elegantly even if the starting Supervillains are replaced with Superheroes from an expansion. Overall, I consider this to be the strongest overall core set for the DC Deck-Building Game. If you don’t mind playing as the bad guys, the gameplay is excellent. The set has some issues, but they are minor and can be addressed. To give you some background, I have had a love affair with comics since my childhood. Marvel, DC, Darkhorse, etc. these modern epics have caused much imagination and enjoyment for me. When a game comes along with an IP in the classic comic tradition, I tend to notice them. Forever Evil is no exception. What, a deck builder as well? Based on the pursuit of evil and playing a super villain, you have my full attention. Forever Evil is a deckbuilding game brought to us by Cryptizoic. The game plays 2-5 people and in a 4 player game plays in about 45-60 min. The deckbuilding is very straight forward in the established format. Power points depicted on the cards enable players to purchase cards in the trade row or conversely, allow players to destroy the current villain in the field. Game play starts with players selecting a super villain to play ranging from Harley Quinn, Bane, Black Manta, and many others. Each of these possess unique asymetrical powers that afford special abilities to each player on his turn. The starting deck of 10 starter cards is distributed and players start with a Hero in que (which is always The Flash)and a trade row of 5 cards is drawn. On a players turn, they draw 5 cards from their deck and begin the process of purchasing cards from the trade row that will afford them locations, powers, equipment, recruitment of lesser villains, or destruction of lesser heroes. In some instances, cards in a players deck may also afford an opportunity to attack other players. Once players are able to get enough power points into a drawn hand they are capable of destroying the current Super Hero in que, namely most members of the Justice League as well as Constantine and Swamp Thing. These Super Heroes are then added to their victors discard pile later to be cycled into the deck. These Super Heroes afford the greatest powers to the player that holds them as well as final points at the end of the game. As Super Heroes are systematically destroyed they are replaced with the next Super Hero in the Hero deck. When this next hero is activated, they commence a one time attack on all players requiring some form of pennance for their evil ways. This usually amounts to discarding or destroying cards at risk of receiving a weakness card, later to plague that player in future rounds or at the end of the game. End conditions occur when the Hero deck is depleted. Players then tally the value of points represented on their individual cards and victory points then subtract the number of weakness cards from their final total. Since this is a deckbuilder, the majority of components are cards (duh). The cards are standard size 2.5″ x 3.5″ and are printed on quality stock with a semigloss sheen. The colour used is bright and cards have a distinct appearance. The illustrations displayed range from adequate to excellent, but this is a matter of taste. This is the first expansion in the DC line-up to use victory tokens. The tokens consist of punched out circular card. The card stock is of reasonable quality however, they are bland in appearance. Another quible that I would cite is that the tokens are of 3 different values, 1, 5, and 10. The numbers displayed on the tokens are not very large or obvious; the tokens don’t vary in colour or appearance; and all tokens are the smae size. It can be confusing to determine exactly what token you are picking up and worse, it can be very difficult at a glance to see how many VP’s your opponent has. I very much enjoyed this game. It is not the best deck builder that I have played but to me, it is the best deck builder in this genre and series. The game can be some what labourious to start into as some of the card interactions and player powers can be fiddley at times. After repeated gameplays this becomes less of an issue. The introduction of the victory points added something that I now feel was missing from the previous DC Deck Builders. Another element that was an interesting change was the emphasis of card destruction. I love this ability. Deckbuilding, in my opinion, always needs to offer its players to thin out their decks and unclog their machines, Forever Evil does this masterfully. This version of the DC deck builder series has been its weakest entry in my opinion. The quality of the product pieces are still great, but the play value is missing something that the others seem to have. One of the biggest problems for the game is that it takes much longer to play than any other version. The slow gain of power in the early game makes it hard to get moving. Also the concept of destroying your newly bought cards to upgrade is very difficult to do for most players. I have played this game and like it but most of my player base at my store would rather play another game before this one. This results in this game sitting on the shelf more than others. 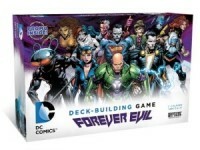 Add a Review for "DC Comics Deck-Building Game: Forever Evil"